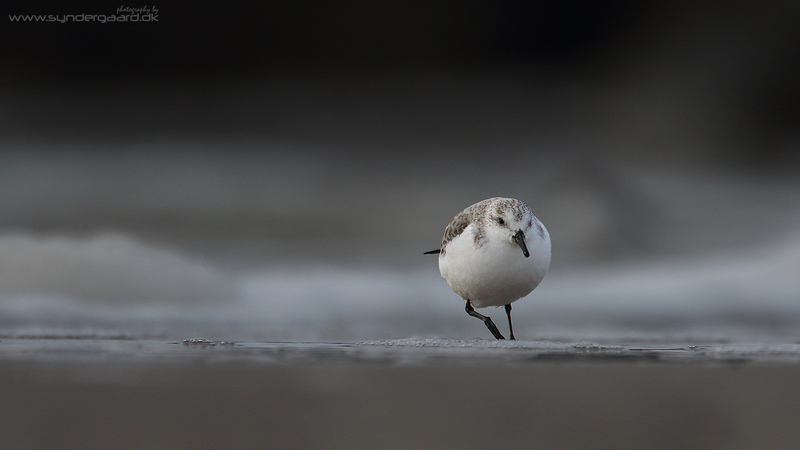 A Sanderling busily roaming the sands for sustenance on a comparatively balmy winter’s day. No winter is complete without a visit to the west coast of Jutland, and some time spent with the wintering shorebirds there. A few weeks ago I finally got around to it, and spent a delightful day with Reed Buntings, Sanderlings, Gannets and Purple Sandpipers. Adding all of these into the same gallery would however make for a somewhat “messy” looking collection – maybe I’ll publish some more images from the rest of the trip later on. The Sanderlings (Calidris alba) were foraging near the south pier in Hvide Sande, in what was probably an oil-spill froth, and while that is certainly quite depressing it did lead to some attractive shots of the birds against this off-white foam. The Purple Sandpipers (Calidris maritima) were hanging at the very tip of the “no entry” pier in Thorsminde – hiking out there on the potentially slippery rocks, carrying the big gun in one hand, was something of an ordeal, but the air was full of foraging Gannets (Morus bassanus) so I couldn’t very well just ignore them and stay back on the beach… To then find 4-5 Purple Sandpipers out there when I reached the tip of the pier was a welcome bonus. The gallery opens by clicking on a thumbnail and using the arrows to browse through the big images. Enjoy! There is more to bird photography than close-up portraits. Off-white foam framing the mostly white Sanderlings. Rocky pier in the background. There are sometimes Purple Sandpipers on it, alas this time these birds were found on another pier. The froth is almost certainly crude oil based – but visually interesting in the images. Taking a break from the slippery slopes. All bird photographys is about getting level with the bird. With these rock climbers that is not easy!